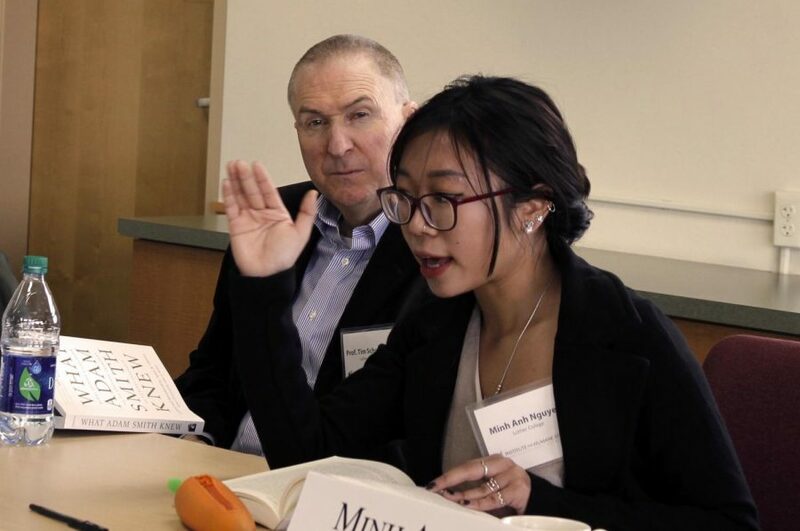 Minh Anh Nguyen ('20) and Professor of Management Tim Schweizer ('90) discuss market morality. Nineteen students participated in a discussion focused on “Markets and Morality” on Saturday, April 21 in the Mott and Borlaug rooms. The event was organized by the Institute for Humane Studies, which holds economics-based discussions at colleges nationwide. The morning discussions titled “Capitalism — For and Against” and “Justice and Liberty.” Each lasted about one hour. The afternoon consisted of two more discussion sessions titled “Critical Perspectives” and “Capitalism and Social Order” along with a dinner. An Institute for Humane Studies director and discussion leader led the discussions. Their role was to call on students who wished to talk and to keep the discussion on-topic. The conversation mainly focused on students and their own perspectives on the readings. Professor of Management Tim Schweizer (’90) was responsible for bringing the event to campus as the Birkestrand Economics and Management Chair at Luther. This position was created by Luther alum Suzanne Birkestrand and Dennis Birkestrand (’64) who wanted to fund opportunities for discussions on economics, specifically pro-market ideas. The lecture on “The Myth of Middle Class Stagnation” by economist Don Boudreaux last fall was also sponsored by this endowment. The participating students had a diverse range of majors and interests. Schweizer said that the Institute for Humane Studies seeks to include students from all different departments, not just students interested in economics. Since the event lasted all day on Saturday and required students to study reading materials beforehand, Schweizer selected students who were willing to do additional work outside of their courses. 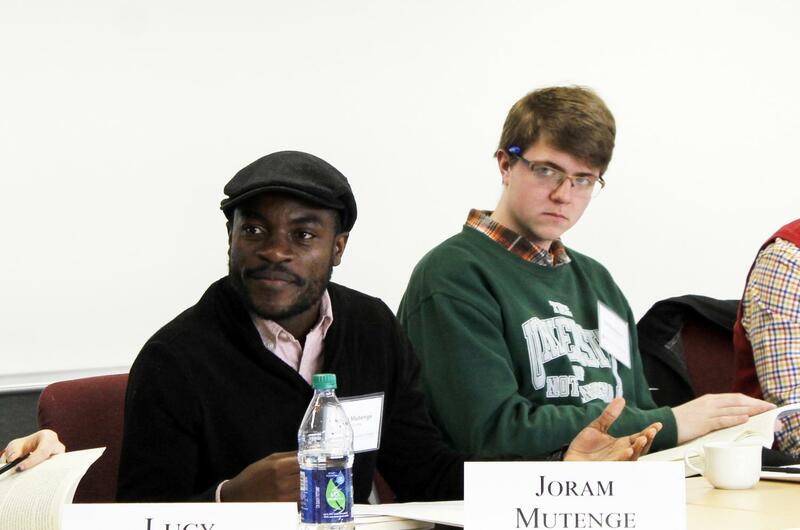 Joram Mutenge (’19), and Karl Nycklemoe (’18) participate in a discussion. Schweizer found more than enough Luther students willing to participate, so much so that he had to create a waiting list for the event. He said that since this was a popular event he will organize more next year so students who were not able to participate will have a chance. Participating student and business major Menzi Nkambule (‘18) said that he was most interested in the discussion on “Capitalism — For and Against” which included readings by economists such as Adam Smith and Karl Marx. He said that he enjoyed how the discussion was structured with minimal input from the facilitator. Nkambule also enjoyed the range of views of the participating students. “This small group of less than 20 students who are open to all views is a good model of how we can use our intellect to have open discussions on challenging topics and listen to one another,” Nkambule said. Schweizer was also pleased with the range of perspectives in the assigned readings from the Institute for Humane Studies. He hopes that the discussion motivated students to think in new ways.